July 29 marked the 125th anniversary of the birth of inventor Vladimir Zworykin, known in Russia as the Father of Television. RIR tells the story of the man who many claim brought about the television era. Vladimir Zworykin was born on July 29, 1889 in the city of Muroma. Located 185 miles east of Moscow, Muroma is the home of Ilya Miromets, epic hero of Russian folklore. The inventor's own life resembles the legend: Zworykin lived through two revolutions, two World Wars, completed a circumnavigation of the globe, and is credited with over 20 inventions, one of them being a television system using cathode-ray tubes. None of the Zworykin brothers wanted to follow in the footsteps of their merchant father. Like his elder brother, Vladimir decided to devote himself to science. It is difficult to credit the invention of television to any particular individual, as a number of pioneers were working on the development of the medium around the same time. Besides Zworykin, Scottish scientist John Logie Baird and American inventor Philo T. Farnsworth are also often hailed as the inventors of TV. Logie Baird successfully transmitted the first greyscale television picture in his laboratory on October 2, 1925 and demonstrated the world's first colour transmission on 3 July 1928. Farnsworth constructed the first working all-electronic television system, which used electronic scanning in the pickup and display devices. Farnsworth unveiled his invention to the press on September 3, 1928. In 1906, Zworykin entered the St. Petersburg Institute of Technology and soon made the acquaintance of Boris Lvovich Rosing. Rosing was the author of the first studies on the electronic transmission of images over distance, subject matter that would loom large in the young student's later scientific activities. In 1912, on a post-graduate residency in Germany, Zworykin was called into service as an officer in the Tsar's army. Russia soon entered the First World War. For a year and a half, Zworykin served with mobile radio-communication units. Just after the February Revolution of 1917, Zworykin's father died. The family home, where the inventor was born and raised, was expropriated. In such a situation, there could be no thought of any kind of scientific activity. Departure for the United States became one of the great adventures of Zworykin's life. It began when the scientist took an offer from the Provisional Government to join a radio communications group in the Siberian city of Omsk. From Omsk he was sent to the United States on a mission to buy equipment needed for the station. Over several months, switching between trains, passenger ships, and even an icebreaker, Zworykin reached his destination after many difficulties. Having completed his assignment, he again returned to Omsk. This time he traveled by way of Japan and China, thus completing a circumnavigation of the globe. After delivering the purchased technology, Zworykin was once again sent to the United States. This time, he did not return. In America, Zworykin spent some time working with the Westinghouse laboratories in Pittsburgh. He was involved in developing prototypes for the first televisions, but he received no support for his own projects. 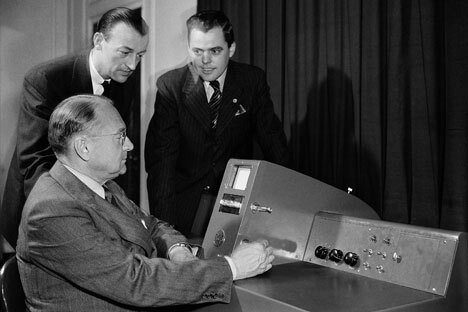 Luckily, the man who oversaw Zworykin's work turned out to be another immigrant from Russia: David Sarnoff, president of the Radio Corporation of America. “What do you need in order to turn your prototypes into a means of television broadcasting for a mass audience?” Sarnoff asked him. “A hundred thousand dollars and two years of work,” Zworykin answered. The project's costs would soon exceed that amount by 30-fold, but that proved to be no obstacle. In 1931, Zworykin completed the design for his video camera tube: the iconoscope that would form the basis of electronic television. By 1932, the RCA Company was already mass-producing televisions with Zworykin's iconoscope, and people living within a 100-kilometer radius of New York became history's first television audience. After spending a decade and a half in the U.S. and comparing himself with more assimilated immigrants like Sarnoff, Zworykin understood that he would never be 100 percent American. His secretary and friend Frederick Olessi recollected that Zworykin spoke English with an atrocious accent, and all his habits and thought processes remained Russian. Zworykin's other inventions in the field of electronics included medical, biological, and military devices. He also played an important role in improving the electron microscope. Zworykin's favorite topics, besides electronics, were memories of pre-revolutionary Russia. However, after visiting the mother country and reconnecting with his relatives, Zworykin decided to remain in the United States. He visited the Soviet Union several times after that, sharing experiences and ideas with his colleagues there. In his declining years, Zworykin spoke of his child – television - with bitterness. “I created a monster that excels at brainwashing all of humanity. This monster will lead our planet to uniformity of thinking. I would never have let my children even approach a television set.” Television's best feature, Zworykin added, “is the off-switch.” And all the same, Zworykin is remembered in Russia as the Father of Television. Text compiled with the recollections of Frederick Olessi - secretary and biographer of Zworykin; Alexander Magun - director of the David Sarnoff Library; and Olga Shcherbinina - director of the history museum at the St. Petersburg State Technological Institute.